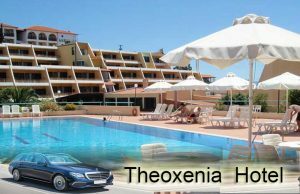 Theoxenia Hotel in Ouranoupoli is a luxury 4-star hotel located on the third finger of Halkidiki . It is an attractive destination for thousands of visitors, both Greek and abroad. It is located 145km away from Thessaloniki airport and It is one of the most popular tourist destinations. In Greek it means the city of heaven. it is also considered to be the Gate to Mount Athos . Because a lot of people arrive at Ouranoupolis to visit Mount Athos. It is also a place that combines mountainous area and sea. The visitors have the opportunity either to enjoy the crystal sea and sunbathe on the beach. Also they can wander in the narrow streets of the village. The visitors can walk in the paths and when they reach the top of the mountain, they can also enjoy an astounding view to the village and mount Athos. As a result ,the city of heaven leads you to heaven and sticks to the visitor’s heart as a pleasant memory. Thessaloniki taxi transfers undertakes your transfer from Thessaloniki airport toTheoxenia Hotel in Halkidiki,most of all with comfort safety and reliability. First of all our luxury Mercedes E class cars always clean and in an excellent condition. In addition our polite, helpful drivers are willing to undercover what a passenger needs . In conclusion, our experience, the high quality of our services and the low cost charge, offer a rather comfortable and safe journey.